On Sunday, 30 September 2018, the Primrose Piano Quartet (Susanne Stanzeleit, Dorothea Vogel, Andrew Fuller, John Thwaites) was joined by mezzo-soprano Louise Winter for Love & Obsession at the Conway Hall's Sunday Concerts series. A programme of music by Robert & Clara Schumann and Johannes Brahms, behind the music, lay the fascinating story of the intertwined relationships of the three. The evening's programme included Brahms' Two songs for alto, viola and piano, Op.91, his Piano Quartet in C minor Op. 60 and a selection of his songs for voice and piano, three songs by Clara Schumann, songs from Robert Schumann's Myrthen, Op. 25 and his Piano Quartet in E flat OP. 47. I was there to introduce the programme, giving a pre-concert talk As if sent straight from God which put the story of Robert Schumann, Clara Schumann (nee Wieck) and Johannes Brahms in context. One intriguing aspect of the programming was that instead of presenting the works individually, the ensemble created a pair of sequences, interleaving the movements of the Brahms quartet with his songs, and interleaving the movements of the Schumann quartet with his songs, thus providing us with a different view of the music and harking back to a different way of programming which was common in the 19th century. 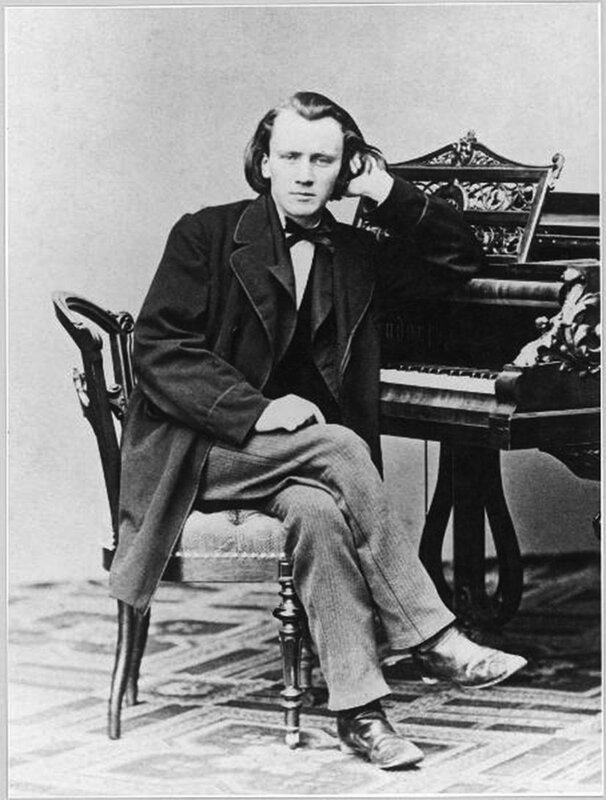 We started with Brahms, the first of his Two songs for alto, viola and piano which were written for the violinist Joseph Joachim and his wife. 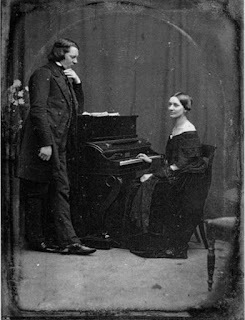 Joachim was a great friend of both Brahms and Clara Schumann, and he had a regular duet partnership with Clara. For 'Gestillte Sehnsucht' we had lovely mellow viola playing and a flowing piano complementing the dark, rich-toned and quite sober performance from Louise Winter. The Brahms sequence, with the movements of his piano quartet interspersed with the songs Standchen Op. 106, Der Tod das ist die kuhleNacht Op. 106 No. 1 and An die Nachtigall Op.46 No.4 provided a strikingly different view of the music. The brooding opening of the quartet with its stormy allegro led to the delightfully characterful Stanchen, which was followed by the excitement of the 'Scherzo'. The next song, from the Four Serious Songs which Brahms wrote in 1896 on Clara Schumann's death, was dark and concentrated, whilst the 'Andante' was singing and lyrical. An die Nachtigall was lighter and rather touching, whilst the finale 'Allegro comodo' built to a thrilling climax. The piano quartet brought out a strong feeling of narrative and story telling in the music, which complemented the songs. Though the music was dark and brooding at times, the group's approach was also quite classical in its approach. Similarly, Louise Winter was often quite sober in the songs, her rich dark voice giving them a certain stateliness. After the interval, we had the second of the Brahms songs for alto, viola and piano, the steadiness of Louise Winter's performance being complemented by Dorothea Vogel's mellow viola. Then three Clara Schumann songs, these all had particular personal references being written as presents for Robert and other people in her life, including one of the songs from a honeymoon collection which she wrote with Robert. Like Robert, Clara made much of the piano postlude but her piano parts tended to be less demonstrative than his, with the focus very much on the voice. Her songs were engagingly direct, with a lovely lyrical line supported by the piano. Finally, we had the Robert Schumann sequence. His Piano Quartet was written in 1842, his chamber music year when he wrote the Piano Quintet, Piano Quartet and three string quartets. The Piano Quartet has never been quite as popular as the quintet (even Clara took some time to take it into her repertoire). Here we heard it interleaved with three songs from Myrthen, the song cycle Robert wrote in the early months of 1840 in the hopeful anticipation of his marriage to Clara. The opening 'Allegro ma non troppo' was quite steady, being characterful and flowing with a lively interaction between the players rather than more romantically impulsive. Widmung from Myrthen was similarly expressive yet quite serious, and the 'Scherzo' was full of controlled excitement and a sense of tension, despite lyrical episodes. Der Nussbaum was delicate, with a deceptive simplicity, whilst the lyrical 'Andante cantabile' showcased the singing cello playing of Andrew Fuller in a movement which was quietly thoughtful in a way which again emphasised the classicism of the group's approach. Die Lotusblume was quiet, concentrated and perhaps a bit too careful, leading to the finely controlled excitement of the Finale. At first did not quite feel we were being swept away, but ultimately we had a wonderfully passionate climax. This was an evening which brought out the serious and the classical inspirations of the music of this supremely Romantic trio of composers. You could imagine performances of the songs which were more lyrically impulsive and less sober, and versions of the piano quartets which were again more romantically impulsive and inflected by the music which came after Schumann and Brahms. But the Primrose Piano Quartet articulated their view of the music very finely and gave us some superbly balanced chamber music playing, and were nicely complemented by Louise Winter's singing. The placing of the songs between the movements of the instrumental music was a lovely way of giving us a different view of this music, though I would have liked to have known more about the group's reasons for doing so and particularly their thoughts on the choice and placement of the songs.